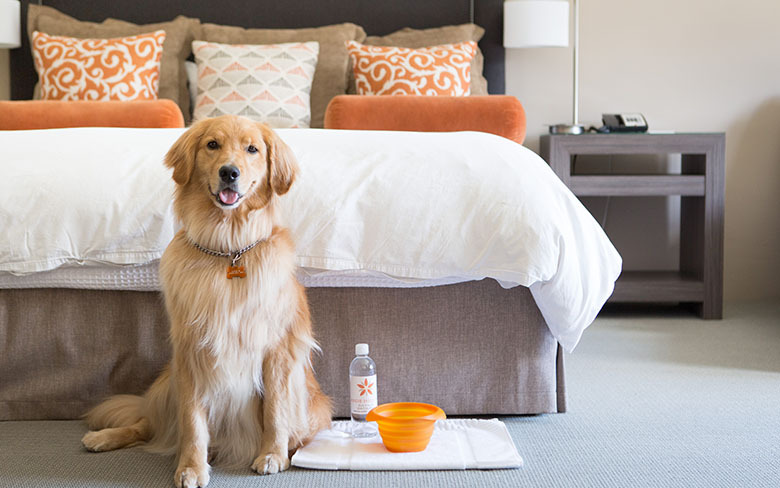 Staying at home is ruff for your best pal, so we invite you to bring them along for your Sun Valley hotel stay. At Knob Hill Inn we are a community of dog lovers and we welcome your four-legged friends to experience all Ketchum and Sun Valley have to offer. The Wagging Tail Escape allows you to bring your dog(s) along on your getaway, and provides everything you’ll need for a safe and fun adventure with your pet while staying as our guests. Please note that there is a $50 per dog per day fee and that pet-friendly rooms are limited. Guests traveling with pets must therefore call 208.726.8010 prior to booking to verify availability of a pet friendly room to avoid the risk of not being able to check in with a pet and/or incurring any associated cancellation penalties. Post a picture of your furry friend on Instagram or Twitter, tag @KnobHillInn so we can share it on our social media sites! Subject to availability; advance reservations are required. Policy waiver must be signed upon check in. Can’t bring your companion along? We encourage you to take part in the Animal Shelter of the Wood River Valley’s Hikin’ Buddies Program and bring a friend on your outdoor adventures.